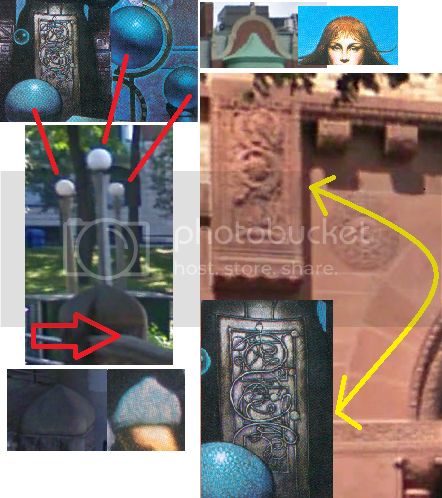 More news, I dared myself to attempt the verse 7 picture 7 pairing and succeeded in picking a location that I hope someone might have a look at: Coliseum Square Park, just a few blocks south of the Margaret "Bread Lady" Statue. BP should've been a history teacher...learning loads of stuff during my endless google bender. Haven't received permission to dig yet, but I have learned the name of the person who will have final say on V5P6 in Corbett, Oregon. I had a theory on New Orleans having to with Paul Morphy. I can't be sure HOW Morphy the great chessmaster is linked, but I find strong verse and image clues lead to the John McDonough statue which I mistakenly thought was a CS Lewis Alice in Wonderland statue...first impressions...and then the Margaret Haughery Bread Lady statue, "the mother of orphans". When I strung clues together I found an enormous lone palm tree in Coliseum park which left me to wonder if Paul Morphy was a play on words for "PaulM" "orphyN" or palm + orphan. Crazy eh? Too fun. Anything is possible, and probable. It sure would be nice to see one oft he remaining 10 surface. I'd bet this book would have a resurrection like no other should one come to light. Keep up the thinking and sleuthing. 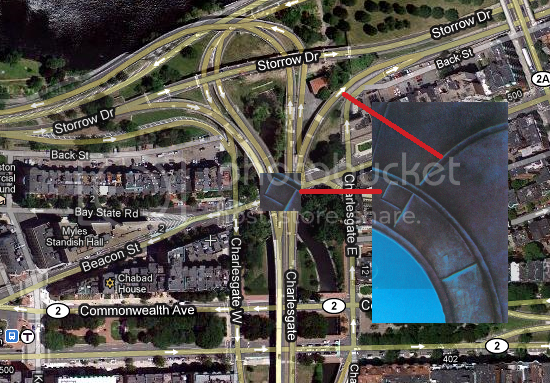 "area" is a "square", find the square on the upper right corner of the occulus in P11, it corresponds to a square area below an overpass at Beacon/Charlesgate. In the middle of the block between the river and I-90 which allows people to pass by Fenway Park (green monster - 37' metal wall), Gil Stratton quote: "Time to call 'em as I see 'em" = coliseum.&#160; Face the water = light post globes (water orbs in P11), and then the actual set of stairs in this area. 18th Greek letter = Sigma, 12th Greek letter = Mu.&#160; Next door to Theta Xi is Phi Kappa SIGMA, Alpha MU chapter.&#160; Day is subdivided by Hours is an analogy to the fraternity being subdivided into a chapter. More focus on lamps and light to find the aligning perspective where the lamp globes match those in P11. 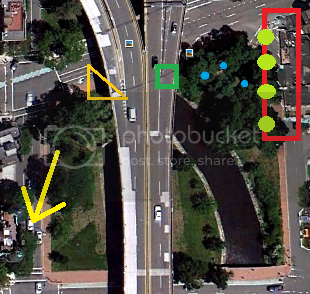 Continuing West beyond the Fraternities use P11 to visually confirm the square area we will find beneath the overpass. 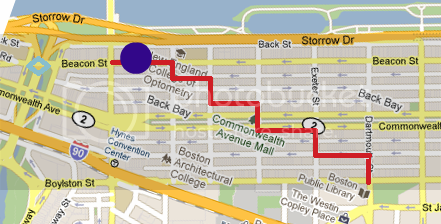 This pic shows the following: yellow arrow points to Fenway Stadium, orange triangle is staircase below overpass, red rectangle is Charlesgate Hotel with "green tower" design, blue dots are lamp globes, and green square is dig spot next to box and railing. More visual confirmers, the facade of the Scientology building opposite the Optometrists College matches the woman's tunic/dress pattern and wall and railing below the overpass has some close matching characteristics. Note to self, port cities. welcome back wk! I rediscovered the site too after a 5 year break. I'm currently waiting for permission to dig in Corbett, Oregon, since sending a more direct and purposeful email to the person in charge of the site. It's been almost a week and no response. I might do better sending a real hand written letter or calling. I'll give it till this Monday and then I'll try to phone the guy. I don't know if this has been delved into on any other boards, but taking into account the authors background, I have noticed a theme that appears to revolve around U.S. Presidents. In the pictures there are outlines of faces, which appear to me to represent a specific president, and that references something in the area with that presidents name, Grants Park, Cleveland. I have been following up this avenue, and looking into areas that conform to this idea. The author did write children's books, and this would have been a possible theme that he might have been familiar with. Cleveland Cultural Gardens were created by students at Cleveland State University. They don't really have anything to do with presidents, past or present. The 24 gardens represent the ethnic and cultural diversity of Cleveland. On a side note, it would be hard in the United States to investigate almost any national area without some involvement with a president somewhere--but there doesn't seem to be any overall theme that I can gather from the book. Fountain of Youth park, Houston, San Francisco, New Orleans---?We are fairly certain of these locations--and there doesn't appear to be any connection to any of them with Presidents.